While Along the Fence will focus primarily on The Ladies, we will continue to rank and post the Boys Top Ten XC teams each week. Let’s see what happened with The Guys in the 3rd week of the season. 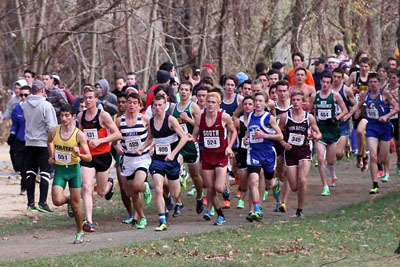 2 Don Bosco Prep 89 2 No Race Puma-Carlisle Inv. @ Carlisle Pa.
3 Cherry Hill East 74 3 Groff leads crediable performance @ OCP ?? In some ways waiting for CBA to debut is like waiting for your dance with the homecoming queen. It’s nerve wracking waiting, it’s over before you know it and the homecoming queen leaves with the king. With no offense to the fine athletes and coaches on the Boys side of the ledger, it’s got to be a daunting experience. CBA will field it’s top unit for the first time this year at the Bowdoin Classic on Saturday and will start what we hope to be their march to a National Title in early December. Meanwhile, there was some great racing and some moves around rankings ladder this past week. This entry was posted on September 24, 2014 by Patrick Montferrat in 2014 Cross Country.